This on demand course is available 24 hours a day 7 days a week. Log in as often as you like for 30 days. Professionals in the mental health field commonly deal with children and families in crisis. With over half of all marriages in the United States ending in divorce, mental health professionals frequently find themselves involved in these complex family structures. Well meaning professionals can be negatively impacted by this involvement if they are unaware of the specialized issues that come with the dynamics of these families and the potential Court interaction. Worse yet, this involvement can not only have long term damaging effects on your professional credibility, but as well on these children and their families. Unfortunately, many children growing up between two homes and their family systems are described as "Shattered," "Broken," or "Divorced" when research actually supports some children fare better post-separation while others face continuing problems from their parents' continuing conflict. 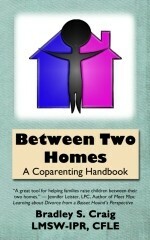 This 5 hour seminar presented by Bradley S. Craig, LMSW-IPR, CFLE author of Between Two Homes: A Coparenting Handbook offers participants the opportunity to familiarize themselves with the higher standard of practice involved in working with these families while learning about current research and knowledge regarding two homes issues. Options will also be presented on resources available to these families. From now until May 1, use the discount code "AprilIBTH2019" for 50% off and the hope you will write a review at the end of the course.